Faced with criticism about high fructose corn syrup, the Corn Refiners Association has embarked on an effort to change the public's perception. Look on the back of a yogurt carton or even a package of cookies, and more than likely you'll find a list of ingredients that seem to require an advanced degree in nutrition to understand. One common sweetener found in many packaged foods is high fructose corn syrup (HFCS). With consumers' increasing interest in healthy food choices, confusion has arisen concerning how HFCS fits into a healthy diet, and, in particular, contributes to obesity and other diseases. This categorization and widespread confusion about the corn-derived sweetener led the Corn Refiners Association (CRA) to begin an education-based effort to help consumers, media, and other influencers revise their opinions. The CRA, a trade organization comprised of all US corn refiners, hopes consumers will understand the substance's similarity to sugar, which has an equal caloric value of four calories per gram, in addition to comparable levels of safety and sweetness, according to Erickson. Also, the CRA seeks to differentiate the ingredient from unrelated, but similar sounding, substances like corn syrup, which is a thickener primarily composed of glucose. In comparison, HFCS is derived from equal parts glucose and fructose, the sugar found in fruits and honey. “All of our industry was extremely concerned about the misinformation that was being pushed out... and misleading them into thinking that there was something [to be] concerned [about],” says Erickson, adding that the sweetener has been approved by the FDA for more than 25 years. In the spring of 2008, CRA hired Weber Shandwick and DDB Chicago to work on a campaign that would help to clear up some of the misunderstandings about HFCS. WS' efforts center on traditional media relations to accompany the rollout of print and TV ads. The agency has tapped top-tier media and health pros, such as doctors and dieticians. Some of these health pros double as media, such as Christine Rosenbloom, a registered dietician and Ph.D who also writes for the Atlanta Journal-Constitution. The agency remains “on the pulse of the research pipeline, making sure that any new research [that] comes up help[s] clarify and set the record straight,” says Maryanne Giustino O'Dowd, SVP at WS. One finding was the American Medical Association's June 2008 resolution that HFCS does not seem to contribute to obesity more than other caloric sweeteners. To get this message out, the agency drafted and distributed a statement to influencers and the consumer-target demographic. As mothers are a primary target, the firm has focused on pitching and creating “compelling” press materials for outlets that focus on parenting, health, and fitness. To readjust these mothers' opinions, the agency zeroed in on the basis of their confusion. For example, a survey found that moms are more interested in individual ingredients than calories when buying food products for their children, so the agency created outreach based on this information during back-to-school season. Nicci Micco, deputy editor of features and nutrition at Eating Well, agrees that there is widespread confusion about HFCS. 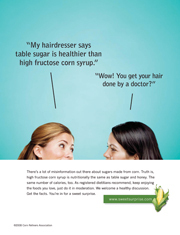 “We did a Q&A about high fructose corn syrup online. And this [generated] one of our most [popular] reader responses,” she says, adding that the magazine will feature the sweetener in the May/June 2009 issue. The overall rise in obesity and other health issues might not be directly attributed to HFCS, but it is still an empty calorie that should be sparingly ingested, says Lanah Brennan, a registered dietician. The CRA is continuing to add to its educational efforts. It will relaunch its Web site, SweetSurprise.com, this month, with the assistance of its ad agency. Also, it is seeking to maintain the progress it has made by vigilantly monitoring print, online, social media, and broadcast outlets daily, according to Erickson. This article appears in print as "Just the Facts."